Wondering what's that refreshing sound filling the air in this side of town? The soothing "Caliville" sound can only come from this distinct source — BRETT YOUNG! 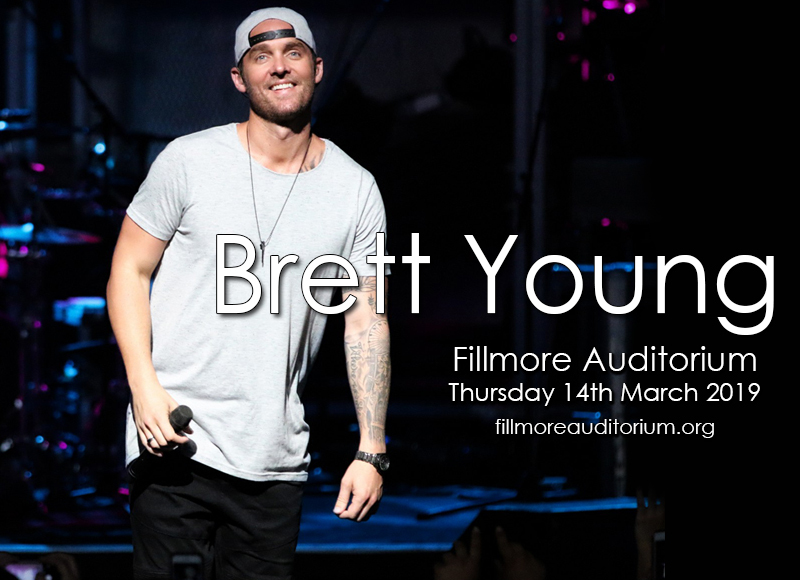 His heartfelt California-meets-Nashville sound is blowing in the wind and is headed towards the direction of the Fillmore Auditorium, making landfall on Thursday 14th March 2019. Touted as the trending American country-pop hottie, Brett Young has a significant young following trailing behind his every move. No pun intended. If you're not quick on the move, this hot ticket might just escape your grip in no time. Clear your schedules on that day and get rid of the hump day. Get an energy boost from the sights and sounds of Brett Young, live! Brett Young spent his early life pursuing and chasing two dreams that meant so much to him–music and basketball. Clinching an Ole Miss baseball scholarship in 1999 was deal breaker that led him to pursue a professional baseball career. After sustaining an elbow injury, he heeded the call of music and began writing songs, as inspired by Gavin DeGraw.